I bet when you saw the picture above, you're thinking....... Marlene, are you nuts?! We're not even through with summer yet! I know.... I know.... I'm usually the one's scrambling to catch up with the fashion collections. I'm finding that designers are churning out one collection after another at super sonic speed these days. What's up with that?! For once, I'm a little ahead of myself but I couldn't resist. I've been looking for a proper winter parka that comes with a detachable fleece lining and a hood. This one's from H&M and the price tag of £49.99 for a 100% cotton parka makes it even more attractive. The great thing is you could remove the lining and wear it over spring and summer. It's like getting 2 coats for the price of 1. I'm totally bored with 99% of coats I see in the stores. *yawn* The same boring design tweaked a little here and there but nothing really original unless you're willing to part with £1K (I'm not!). Now if you have a small build though not exactly skinny and rather vertically challenged individual like myself, coats that are too cocoon-y can overwhelm my frame. I'm in love with the slim fitting Isabel Marant Etoile Clifford coat. It's sophisticated and contemporary. It's a little like a pea coat but with a twist. 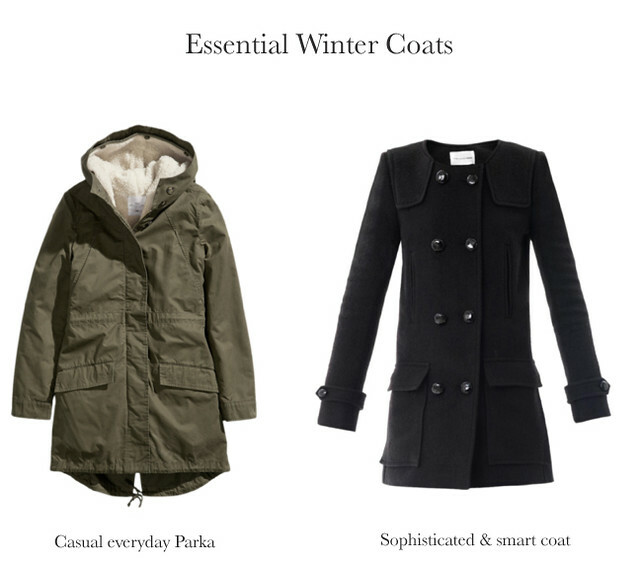 It helps that good ol Ms Marant designed the coat with plenty of pockets. Yesssss! More places for me to stuff my tissues, keys, cellphone, receipts etc etc etc etc. It's practical but above all, it jazzes up a simple outfit. It's not a bad buy at all for £425. What are your thoughts on these 2 coats? I'd wait the FW collections are just starting to trickle into the stores. Mango had quite a few Marant-esque coats (not available yet) in their fall lookbook. And if you're looking @ H&M you may as well hold out til Nov? for Marant's collection. Zara has some nice basic ones, but not compelling enough for someone like me who lives in the tropics. No - not mad at all - buy now before they sell out :o) Besides, I've got my Uniqlo down jacket already - I'm ready for the winter this year! Ordered that 3 weeks ago - no flies on me! One thing about the H&M jacket - if it's a detachable lining - check the sleeves to see how they are lined. So many sleeves are too thin and I can't do with cold arms. Already shelved a number of options for this reason. I don't think you're mad at all. I may just be working on a post for winter boots!! Although not normally a Marant fan, I'm loving that coat. As someone who's also vertically challenged, I completely understand the need for a coat that doesn't swamp. Looks like you've found it! Isabel Marant all the way! I just like the silhouette of wool coats and all the color possibilities (yes I have a bright pink one). I wish there was some hybrid possible since wool isn't waterproof. Oh and Mackage is my favorite coat brand. They make coats with amazing cuts with leather details. I've gotten a compliment every time I've worn my Mackage coat - even from the sales associate at Saks! Oh I spotted the IM Clifford coat on Matches the other night, gorgeous! Ok for coats ...... but maybe in the market for a shorter casual one. I need that Clifford! Perfect. Oh no! I'm guessing the damage was on the woolen exterior? That'll be pretty hard to fix.